Cherries occupy the Cerasus subgenus within Prunus. They are members of the Rosaceae family, subfamily Prunoideae. Prunus avium L. is the Sweet Cherry, and Prunus cerasus L. the Sour Cherry. P. fruticosa (ground cherry) and P. pseudocerasus (Chinese cherry) are other minor fruit species. Cherries originated in Asia, but spread to Europe early on. Cherry pits have been found in the remains of prehistoric lake dwellings in Switzerland. The name Cherry dates back to 300 BC, after the Turkish town of Cerasus. In the 1600’s cherries arrived in North America with the settlers. Cherry-trees are cultivated for their fruit (fresh, canned, served in syrup, jams, jellies, and liquors) and also for their wood, which is much valued in woodworking. Most cherries have been grafted onto a rootstock. Leaves are relatively large, elliptic with acute tips, petioled, and strongly veined. Flowers are white, with long pedicels, borne in clusters of 2-5 flowers on short spurs with multiple buds at the tips. The distal bud is vegetative and continues spur growth. Bloom occurs relatively late in spring, so frost is less of a hazard than for other stone fruits. 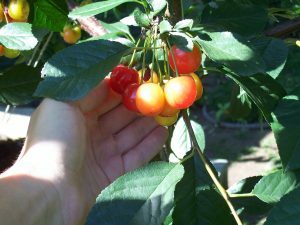 Maximum yields from sweet cherries are obtained beginning in the 5-6th year after budding, and trees are productive for 25-30 years, despite living much longer. Each spur is long-lived, producing for 10-12 years. Sweet cherries need cross-pollination, while tart cherries are self-fertile. Fruiting begins earlier for sour cherry trees, after 3-4 years, but productive life is shorter – only 20-25 years. Sour cherries are the latest blooming of the stone fruits, therefore are less frost prone to frost damage than sweets. 35-45% of the flowers are borne on 1-year wood, not exclusively on spurs as in sweets. Spurs are also shorter-lived on sour than sweet, gradually declining in productivity over 3-5 years. Sour cherries tend to be a bit more cold hardy overall. Wild and domestic cherries contain cyanogenic glycosides in leaves, bark and seeds. P. serotina is the most dangerous species in the Rosaceae. Children have been poisoned by chewing twigs, eating seeds, and making tea from leaves. All classes of livestock have been killed by eating leaves. Fresh cherries are very nutritious. They are rich in Potassium, Vitamins A and C, Magnesium, Phosphorus, Folic Acid, Calcium, and even a bit of protein.